At our April 2nd edition, Mary Robinette Kowal brought us this magical excerpt from her new novel Without a Summer. And you'll want to watch all the way to the end because she brought shadow puppets too! Video: William Shunn wants to know "What Changed?" If you enjoyed that, please join us at 7:30 pm on Tuesday, May 7th, 2013, upstairs at Hopleaf, for an evening with Suzanne Clores, Mary Beth Hoerner, Robert McDonald, Dion Walton, and former co-host Sara Ross Witt. Don't miss it! on green beer, shots, and snowfall. The lamb may be late. If you enjoyed that, we'll have more video from the evening coming up in the next few weeks. And please join us at 7:30 pm on Tuesday, May 7th, 2013, upstairs at Hopleaf, for an evening with Suzanne Clores, Mary Beth Hoerner, Robert McDonald, Dion Walton, and former co-host Sara Ross Witt. Don't miss it! It was a packed room for this past Tuesday night's edition of Tuesday Funk at Hopleaf, which means the chances are pretty good you were there enjoying it all with a cold beer in your hand. But if not, let us recap what you missed. We kicked off the festivities with Jeremy Jasper, who brought us a heartfelt true tale of childhood terror. Reagan Keeter followed that up with his fanciful tale of childhood terror, featuring ghostly tots down an ominous well. New co-host Andrew Huff debuted a new monthly feature with a handful of Haiku by Andrew for spring. And Wesley Chu treated us to a funny-scary encounter with a mugger in an effervescent excerpt from his debut novel, The Lives of Tao. After a break for beer, co-host William Shunn gave his short-short story "What Changed?" (written for 20x2 in Austin) its Chicago debut. Next, novelist and puppeteer Mary Robinette Kowal read us an entertaining excerpt from her latest novel, Without a Summer, then followed that up with a shadow-puppet play! And as if that weren't multimedia enough for you, Tuesday Funk co-founder Reinhardt Suarez made his triumphant return to our mike with excerpts from his novel The Green Ray of the Sun, overlain and interpersed with music from his fine band The Pork Chop Express. All in all, it was an unforgettable program, and a great way to welcome Andrew aboard. But if you couldn't be there, don't despair. We'll bring you plenty of video excerpts in the weeks to come, and then we'll try to top ourselves yet again on Tuesday, May 7, 2013, with a program featuring Suzanne Clores, Mary Beth Hoerner, Robert McDonald, Dion Walton, and former co-host Sara Ross Witt. Don't miss it! Reminder: Tuesday Funk #56 is tonight! Don't forgettonight is Tuesday Funk's 56th episode, featuring Mary Robinette Kowal, Jeremy Jasper, Wesley Chu, Reagan Keeter, and Tuesday Funk co-founder Reinhardt Suarez. Don't miss it! 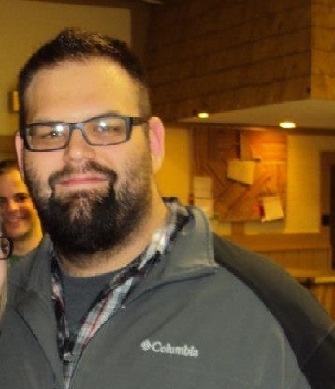 Jeremy Jasper obtained his bachelor's degree in Law Enforcement from Western Illinois in 2011 and is currently working towards his second bachelor's degree in Fiction Writing at Columbia College Chicago. His fiction has appeared in Joyland: A Hub for Short Fiction, and his non-fiction has appeared in the Atticus Review. 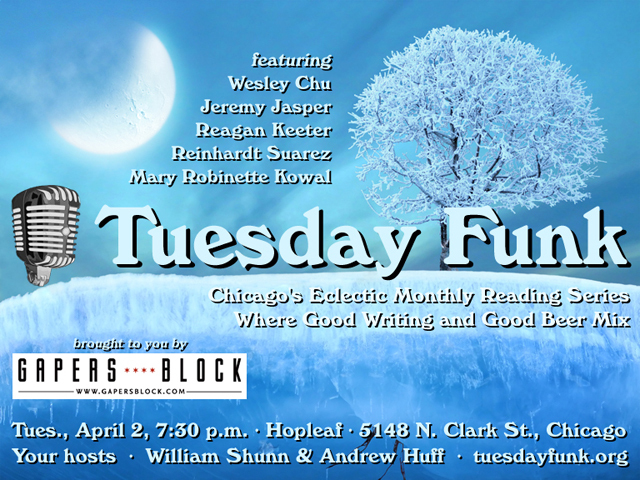 Please join Jeremy and all our outstanding readers on Tuesday, April 2, upstairs at Hopleaf at 7:30 pm. This 21-and-older-only event is free. This page is an archive of recent entries in the Reading # 56 category. Reading # 55 is the previous category. Reading # 57 is the next category.